​Strategic planning in Latin America can inspire dread — though it doesn’t have to. One major issue is that multinationals don’t invest enough time, resources and external assistance for the execution of a useful plan. Another is that no one really has analyzed why LatAm strat planning goes wrong. 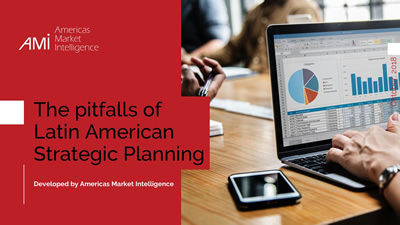 Over the course of the past quarter century as we’ve studied the region, Americas Market Intelligence (AMI) has worked with dozens of firms to strengthen their strategic plans with timely, insightful intelligence. For a short list of clients, we have coached their strat planning process. Recently, we also surveyed multinationals to better understand their approach to strategic planning in Latin America. Combining our experience with the data we’ve uncovered, we’ve created a detailed but easy-to-follow presentation that highlights eight key blunders that companies make with strategic planning in Latin America — and what the best practices are for success. And more, all based on direct experience working with companies in a wide range of industries — consumer/retail, automotive, healthcare, industrial, technology, among others — to develop successful strategic plans for Latin America.